1. Let the gun point where it wants to point. For the best precision, a shooter should not fight his rifle. The most consistently accurate shot is the one where no adjustment is necessary to bring the gun on target. Behind this theory lies the concept of “natural point of aim” which is usually the first thing I teach someone after the basic safety rules. When held, every rifle wants to point a certain way, and it’s up to the shooter to make sure that is at the target they want to hit, not to try and wrestle the gun where it wants to go. For a beginner to be successful, they must begin to think not of the rifle as a separate object, but of the rifle-shooter combination as one unit. Doing this is surprisingly simple: Hold the rifle in a natural shooting position (whether that be standing, kneeling, seated, prone, or on the bench) with your eyes lined up with the sights and the target. Close your eyes, and keep them closed. Relax, like you’re trying to go to sleep. Breathe in and out for two or more cycles. Open your eyes. Your eye-sight alignment will most likely have moved. Instead of wrestling the rifle over to the target, imagine your whole body as resting upon a swivel, and move the whole rifle-shooter unit. New shooters may find guns loud and uncomfortable; beyond that is follow through. The lack of reaction to a shot is in many ways what separates a decent shot from an excellent one. Even though follow through may be one of the more common tips on this list, I feel as though it isn’t well-understood by many. At the beginning, follow through will mean taking extra time and care in reacting to a shot, waiting several seconds of more to breath, release the trigger, operate the action, and otherwise continue shooting. Describing what follow through is can be hard; it’s much easier to describe what it’s not: Movement. The ideal follow through is the one that is totally identical to the position the shooter was in when the shot broke, and is held until the bullet is downrange. Most importantly, you should hold the trigger back until you are ready for the next shot, not release it when you feel you are done with the last one. The fundamentals of shooting are cultivated best, in my opinion, in the prone position. Don’t be afraid to begin shooting in prone and then work on other stances. Prone is the most accurate shooting position, besides the bench, and that isolates your aiming errors away from problems with your shooting position. It’s also the easiest position to learn. Slings are cheap; a cotton or nylon USGI sling can be had for less than $20, and sling swivels for less than that, but they have a huge effect on your shooting ability. Not only will they make you more accurate and precise, but they’ll open up for you a whole new world of shooting positions that are both practical and fun. Just make sure you get an actual shooting sling, and not just a carrying sling. If a shooting position isn’t working for you, change to a different one. In particular, if you find you have to readjust how you hold the gun after every shot, then that shooting setup is not what it could be. This problem occurs most often when a new shooter is using a bench or standing, which is one of the big reasons I recommend the prone position: almost anyone will find a properly set up prone position (preferably with a sling) very repeatable. 6. Shoot reactive targets at longer ranges, rather than paper at closer range. Steel, balloons, fruit, bottles, soda pop, and other reactive targets give the new shooter instant feedback regarding what they’re doing. However, they don’t always cultivate great precision in shooting. To improve with precision, try shooting the same targets further away, if possible (not all ranges accommodate this). In my experience teaching newbies, it’s always more rewarding to shoot a steel plate at 200 yards than to shoot an excellent paper group at 25. Further, when teaching a new shooter with reactive targets, always call out their hits loudly so that they can hear it, and don’t emphasize their misses. 7. Shoot with both eyes open. 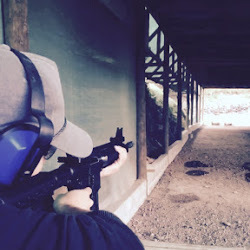 For guns with iron sights and some kinds of optics (red dot sights or a both-eyes-open scope), shooting with both eyes open allows the shooter to relax more, enhances their field of view, and allows them to focus more on what they’re doing. If possible, learn your eye dominance, and shoot with both eyes open. 8. Don’t worry, be happy. Relaxation is key to good shooting. When you first start shooting, go to the range on nice days when the sun is out and you feel good, and years down the line, just going to the range will make you feel happy and relaxed. You’ll not only enjoy shooting a lot more (and thus do it more often), the good mood will make you a better shot, too.